And when you get down to it, God really isn’t asking that much of me. He simply wants me to stop living as if I were the center of my own little universe. He wants me to see that a life spent tending to myself only is not a true life at all. +In the Name of the Father, and of the Son, and of the Holy Spirit, One God. Amen. 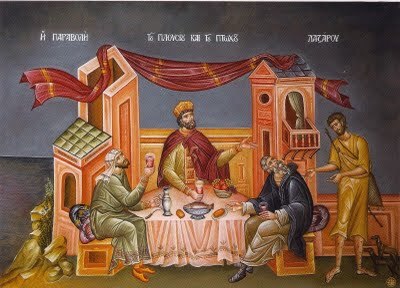 This morning’s Gospel Lesson is the parable of the Rich Man and Lazarus. 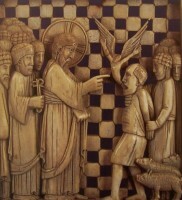 Over the years, I have heard many Christian teachers claim that one should not attempt to derive doctrine from the parables of Christ, asserting that they utilize confusing symbolism and hidden meaning, making it difficult to clearly understand what Christ is trying to say, thus leading to the possibility of doctrinal error. However, it seems to me that there are plenty of people who misunderstand and misinterpret even the plain and straight-forward teachings of Christ, such as where He says, “Unless a man is born again of water and the Spirit, he shall not see the kingdom of God,” or where He says, “Unless you eat the flesh of the Son of Man and drink His blood, you have no life in you”. These are both very clear and direct statements of Christ, understood by the apostles and the Church from Day One to apply to Holy Baptism and the Eucharist, respectively. Yet today many Christians no longer care to know what the apostles or the early fathers actually taught, or what the early Church believed. They no longer measure their own beliefs by this yardstick, but are content to accept contemporary doctrinal models, even if that means creatively reinterpreting or outright dismissing certain portions of the Holy Scriptures that just don’t quite fit. Case in point: our parable this morning. There are things here which align with historic Christian teaching quite well, but which tend to make many modern believers cringe. For example, when the eternal destinies of these two men were prefigured by the one being carried away by angels to Abraham’s Bosom, and the other descending into the torment of Hades, absolutely no mention was made of the personal faith of either of them. For many of our brethren today that’s a positively ghastly omission! What’s even worse is that Father Abraham told the Rich Man that Lazarus was being comforted because his life had been one of abject misery, whereas the Rich Man was being tormented because he had lived a life of great comfort coupled with a callous neglect of the needs of those around him. This would seem to move us even farther away from the modern notion that salvation is entirely a matter of “right faith” alone and has nothing to do with one’s earthly “works” or way of life. We begin to understand why the parables of Jesus are not so popular today. And not just the parables, but much of our Lord’s teaching as well. For, while He spoke often of the need to believe in Him for eternal life, He also spoke throughout the gospels on the need for charitable works and righteous living as well. In fact He summed up His teaching on this matter by warning us, “Not all who say to Me, ‘Lord, Lord,” shall see the kingdom of heaven, but those who do the will of My Father who is in heaven”. Clearly, not all who merely believe and call Jesus “Lord” will be saved, but only those who do the will of Jesus’ Father in heaven. This is important for all of us to remember. And what is the will of Jesus’ Father? We find that taught to us in such places as Matthew 25, where we are told to feed the hungry, give drink to the thirsty, care for the stranger, clothe the naked, visit the sick, minister to those in prison, and preach the gospel without error. In other words, we are to be the hands and feet and the heart of Jesus, and do what He would do in the midst of such human suffering. We are, after all, His Body on earth, called out from among the nations to carry on His ministry to the fallen and hurting people of this world. The things that we see that He did during His lifetime on earth, we are to continue to do, that His love might be manifested in us and through us, and that the world might know that we are His. This is the true Christian gospel that far too often has been distorted or neglected by so many people today. And here I include Orthodox, Catholics, and Protestants alike, for we all share a measure of guilt in this. Yes it is true that some people subscribe to distorted, even heretical teachings that claim that God only cares about what a person believes and is entirely unconcerned with how they actually live. But there are many, many more believers who attend churches in which both right believing and right living are preached, yet they simply fail to live up to it. As I look at this parable, I certainly find much that I need to pay closer attention to. I sense that I am probably not the Lazarus character here, so unless I get to be Father Abraham, that only leaves one other guy that might be me. It’s not too cool to think of myself as the Rich Man in this parable, but aside from the “dressing in purple and dining sumptuously every day” bit, in every other way the resemblance is uncanny. I am almost always far more concerned with my own life and pleasure than with the real needs of others. It is easy for me to look past those in need and ignore them. I don’t mean to paint an entirely negative picture of myself; sometimes I am the very model of spirituality. When I hear of someone’s great need I may fall piously to my knees and pray, “Oh Lord, raise someone up to help that person! Someone else, Lord, because Thou knowest how busy I am”. Yes, it is very easy for me to be too busy, too protective of my own time, and too blind and unfeeling, just as the Rich Man was with poor Lazarus. And when you get down to it, God really isn’t asking that much of me. He simply wants me to stop living as if I were the center of my own little universe. He wants me to see that a life spent tending to myself only is not a true life at all. God is a good Father, and like all good fathers He wants His children to outgrow the narcissism of childhood and learn to love and to care for others. That is such a hard lesson for many of us to learn, isn’t it? We tend to live for ourselves or our own families, for work and for play, and make so little time for anything or anyone else. God wants us to give of ourselves for others, lest we wind up like the Rich Man in a place of torment caused entirely by our own selfishness. Yes, this parable is vitally important to our life and instruction. Good works of charity are necessary to our salvation. It is sad that many believers today deny this, thinking all the while that they are protecting the “true gospel”. What is even sadder however is when Christians know that works of love and mercy are important, but still don’t make the time to do them. No one is saved apart from Christ. But neither can any Christian expect to ignore the needs of others and be awarded heaven strictly on the basis of his pure “faith alone”. We need faith in Jesus, and we need to allow that faith to mature in us, leading us to works of mercy, works that show forth Christ in us, works that ultimately validate our faith and give it life. May such living faith be found in each of us. +To the glory of God the Father, the Son, and the Holy Spirit. Amen.